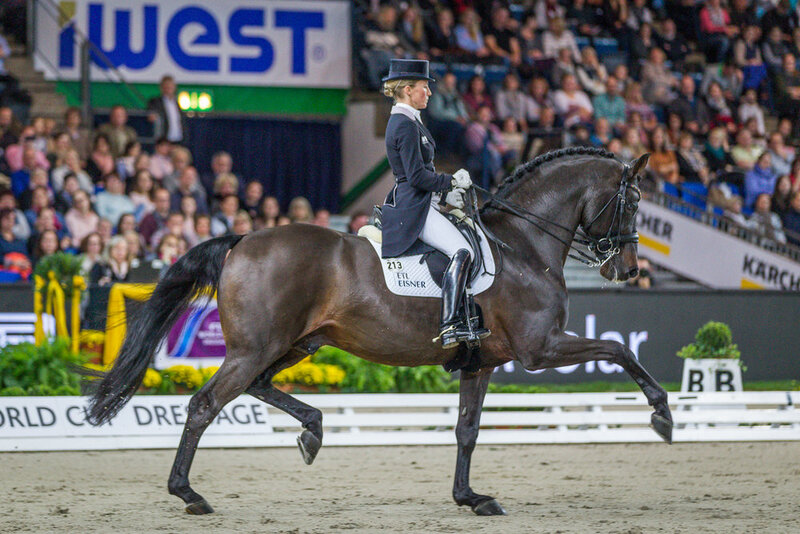 Münster, Germany - Jan. 15, 2018 - After impressive CDI performances this fall, Leatherdale Farms' Hanoverian stallion, Damsey FRH, and Olympian Helen Langehanenberg have moved up to the ninth spot on the FEI World Individual Dressage Ranking list, announced on Jan. 2 by the Fédération Équestre Internationale (FEI). "It is really quite amazing to me that we are now ranked ninth in the world!" Langehanenberg said. "I always believed in Damsey. He's an absolutely special horse for me and I love him. I'm very thankful that Louise [Leatherdale] and Susanne [Meyer] have allowed me the opportunity to ride him. "I have had many horses, but I think the team gold medal with Damsey at the European Championships in Gothenburg, Sweden, in August was really special for me," Langehanenberg continued. "Honestly, I am very proud of him. It's not always normal that you get a 14-year-old stallion and start a career like this. He feels really young and strong in his work. He is the whole package." Helen Langehanenberg and Damsey FRH. Photo by Elena Zobova. In November, the pair had a stellar performance at the CDI-W in Stuttgart, Germany, where they received a 76.060 percent in the Grand Prix and second place as well as third place in the Grand Prix Freestyle with a 79.615 percent. The duo headed to Stockholm, Sweden, next to compete in the CDI5* in December and placed fourth in the Grand Prix with a 77.76 percent. They improved in the Grand Prix Freestyle and received an impressive score of 82.665 percent for third place. "He had no weakness in Stockholm - he had a super walk, a super trot and a super canter," Langehanenberg said. "He can do every moment for high scores. He was so fresh and easy to ride. He was light off the aids and focused in competition mode. If he wants to compete, he has no weaknesses. He showed us what he can do. "When we competed in Stuttgart, Damsey was really hot, maybe too hot in the end, but I loved it!" Langehanenberg exclaimed. "He was so funny, fresh and happy to be at a show again. To get these improvements and have him so hot and fresh at these last two shows gives me an amazing feeling. I was proud that I got him going that much. He really fights for us." Most recently, Langehanenberg and Damsey FRH swept the CDN Münster K+K Cup on Jan. 12-14 in Germany. They earned their highest Grand Prix score to date to win the Grand Prix with a 78.08 percent and they won the Grand Prix Special with an impressive score of 79.745 percent. With a standout year in 2017 and a great start of the 2018 season, Langehanenberg looks forward to competing in more World Cup qualifying shows though the FEI World Cup™ Dressage Final in Paris will be up in the air as she is pregnant with her second child.